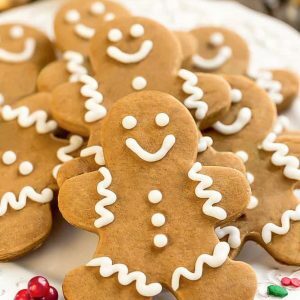 Keto Gingerbread Cookies – gingerbread men cookies are a classic holiday favorite perfect for baking season. Made with low carb ingredients and perfectly spiced with cinnamon, ginger and molasses. The holiday season is here in full swing and that means it’s time for baking all the cookies. Sugar cookies, snowballs, thumbprint cookies and of course gingerbread men cookies are a few of the classic favorites we make every year. 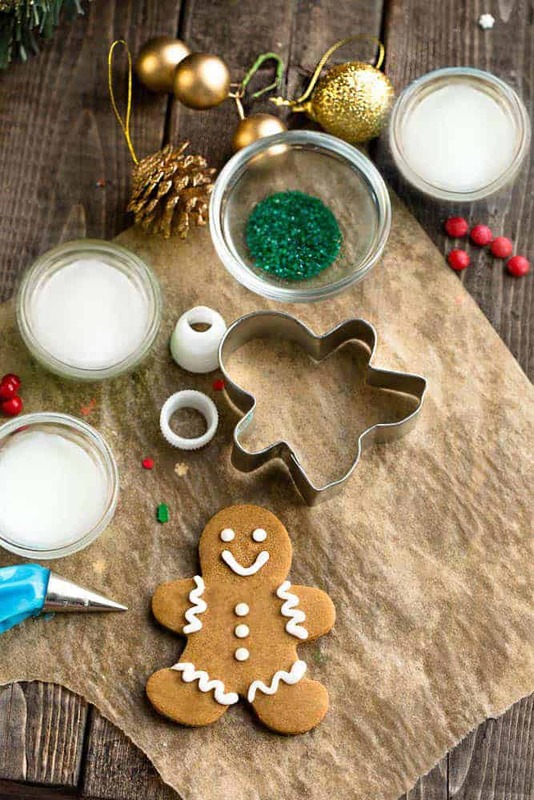 As busy as December can be, there is just something so cozy and comforting about dedicating a chilly afternoon or two to creating fun and festive Christmas cookies! Gingerbread men cookies (or gingerbread people cookies) are one of my kids’ favorite kinds of holiday cookies to make. Even if you’re not a gingerbread cookie fan (say what?) you gotta love how fun and totally adorable they are. Plus, gingerbread cookies are so versatile since you can cut them into virtually any shape and decorate them however you like. These Keto Gingerbread Cookies have all the traditional flavors we all love about soft and chewy gingerbread cookies. 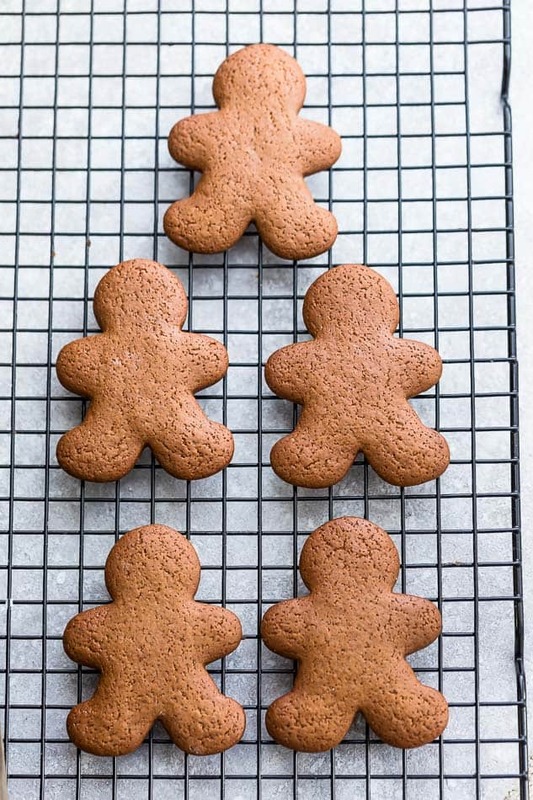 WHAT INGREDIENTS DO YOU NEED TO MAKE SUGAR FREE GINGERBREAD COOKIES? 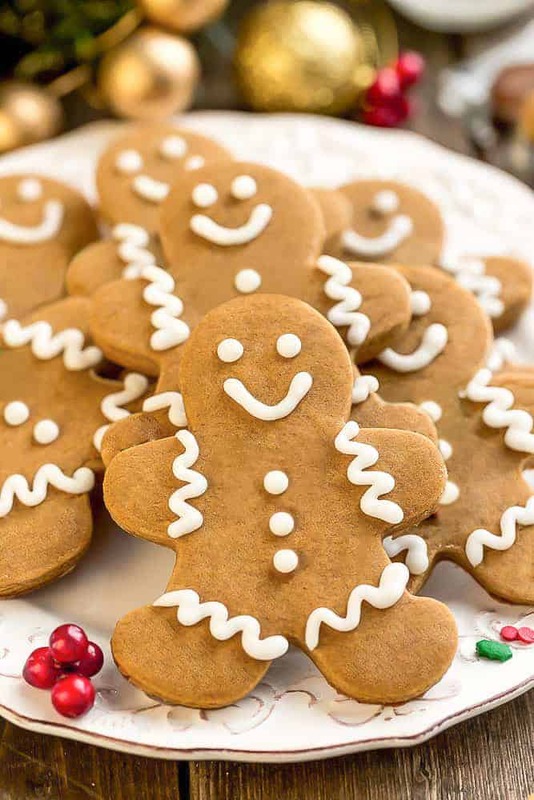 To begin making these healthier gingerbread men cookies, you’re going to whisk together the almond flour, coconut flour, cinnamon, ginger, cloves, salt, baking soda and xanthan together until combined. Using a stand mixer or a hand mixer, cream together the butter with monk fruit sweetener until light and fluffy. Add the molasses then slowly add the dry ingredients and mix until thoroughly combined. Pour in milk (1-2 teaspoons at a time) only as needed if the dough seems too dry and does not come together. 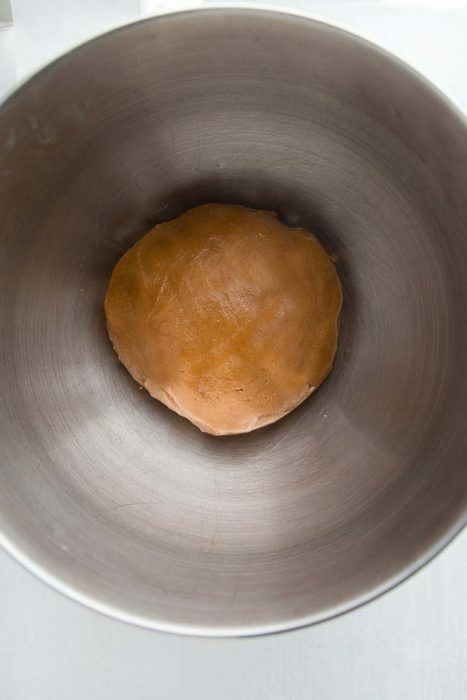 Form the dough into a ball and refrigerate for at least 30 minutes, or up to 2 days. When ready to bake, remove dough from fridge and roll between two large sheets of parchment paper, into a 1/4 inch thickness (1/8 inch for thinner cookies). Place the cookie dough sheet in the freezer for 10 minutes. Place rolled dough sheet (with parchment papers) on a large baking pan and chill in the fridge for 1 hour or freezer for 10 minutes. Line two large baking pans with parchment paper and set aside. Remove dough sheet from freezer, peel off both parchment papers to ensure the dough is not sticking and lay back on top of bottom parchment sheet. Using a cookie cutter (I used a 3-inch), cut into shapes and transfer to lined baking pans at least 3/4 inch apart. Repeat with remaining dough. Place baking sheets in pan in the freezer again (to avoid spreading) for at least 10 minutes. Heat oven to 325 F degrees. Bake (one pan at a time) in preheated oven until cookies are puffy and just set around edges, 12 to 16 minutes, rotating pan halfway through. Be careful not to overbake. Allow cookies to cool on baking pan for 25 minutes, then remove with wide metal spatula to wire rack to cool completely. Repeat with any remaining dough. Just like these keto sugar cookies, it’s important to refrigerate the dough for at least 30 minutes, and up to 2 days. This helps the dough roll out cleaner and helps the gingerbread men keep their shape. Roll out the dough to 1/4 inch thick between two parchment papers. The parchment paper helps to ensure the dough does not stick without having to incorporate any extra flour into the dough. For a crispier cookie, roll the dough out to 1/8 inch. 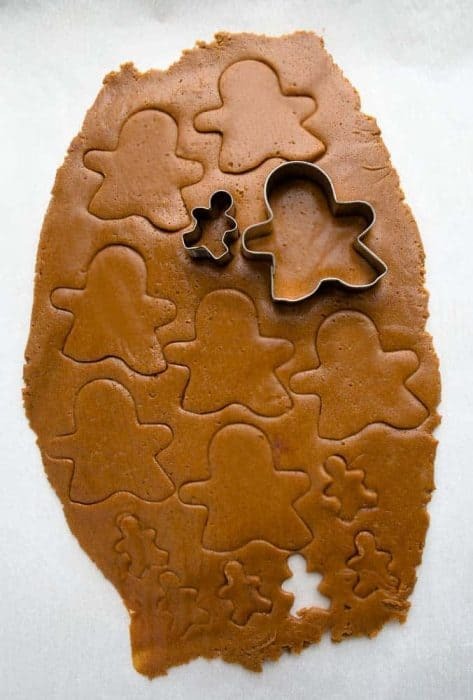 Place the gingerbread cutouts at least 1 inch apart so they have enough room to breathe. If you are using a standard sized gingerbread cookie cutter, the cookies should only take about 12-14 minutes in the oven. For smaller cookies, you may have to reduce the time to 7-10 minutes. Once the cookies are done, allow the cookies to cool for at least 25 minutes on the baking sheet. Do not attempt to move them while they are still fragile and warm, otherwise they will break. The best part about making keto gingerbread cut-out cookies is that you can leave them plain or decorate as desired. The great thing about making Christmas cookies is the ability to make them ahead and freeze the dough in advance. Once you have frosted your Keto Gingerbread Cookies, you can package them up in gift bags or fill up your cookie trays in a single layer. 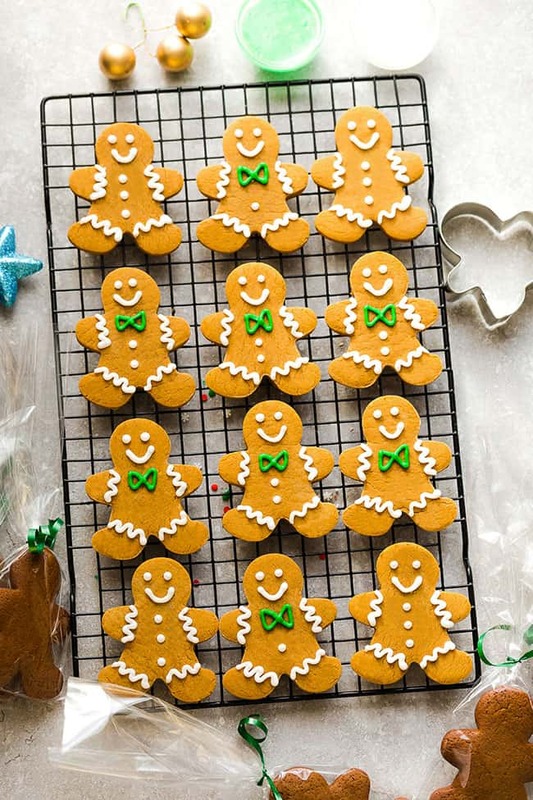 These sugar free gingerbread cookies can be stored in an air-tight container for up to 1 week. You can also wrap the unbaked cookie dough in plastic wrap and store in the freezer for up to 3 months. WHAT COOKIES MAKE THE BEST CHRISTMAS COOKIE PLATTERS? 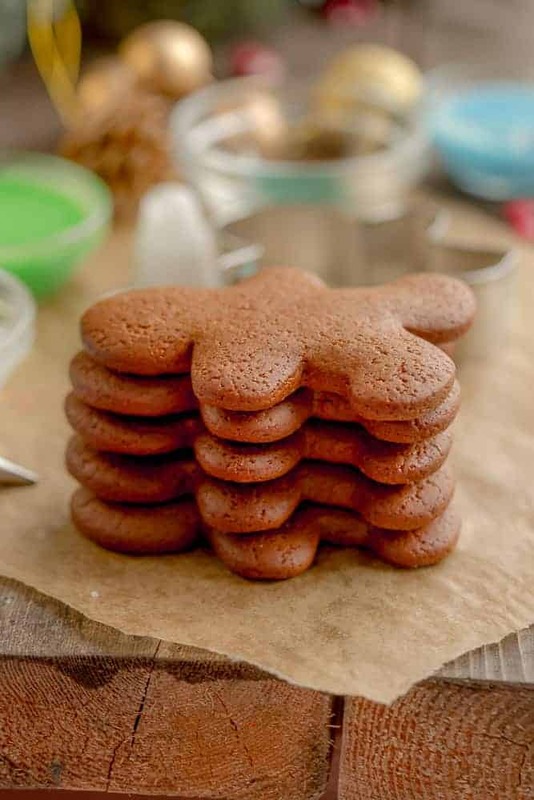 Keto Gingerbread Men cookies - a classic holiday favorite perfect for baking season. Made with low carb ingredients and perfectly spiced with cinnamon, ginger and molasses. In a large mixing bowl, whisk together the almond flour, coconut flour, cinnamon, ginger, cloves, salt, baking soda and xanthan gum together until combined. Using a stand mixer or a hand mixer, cream together the butter with monk fruit sweetener until light and fluffy. Add the molasses then slowly add the dry ingredients and mix until thoroughly combined. Add milk (1-2 teaspoons at a time) only as needed until the dough comes together. When ready to bake, remove dough from fridge and roll between two large sheets of parchment paper, into a 1/2 inch thickness (for thicker cookies) or 1/4 inch thick (for thinner cookies). Place rolled dough sheet (with parchment papers) on a large baking pan. Place baking pan in the fridge for 1 hour or freezer for 10 minutes. Remove dough sheet from freezer, peel off both parchment papers to ensure the dough is not sticking and lay back on top of bottom parchment sheet. Using a cookie cutter (I used a 3-inch), cut into shapes and transfer to lined baking pans at least 3/4 inch apart. Repeat with remaining dough. Place baking sheets in freezer for 10 minutes (to avoid spreading. Heat oven to 325 F degrees. Allow cookies to cool on baking pan for at least 25 minutes, then remove with wide metal spatula to wire rack to cool completely. Repeat with any remaining dough. Decorate as desired or store in an airtight container for up to 3 days or in the freezer for up to 2 months.